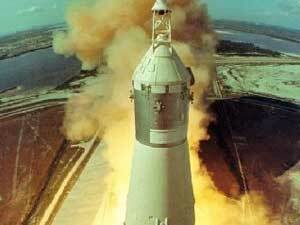 Launch of Saturn V rocket destined for the Moon. 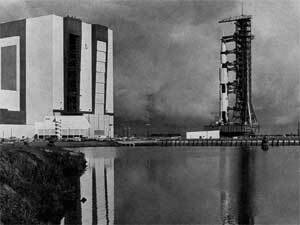 Kennedy Space Center as it appeared in the mid-1960s. The 350-foot tall Saturn V launch vehicle has emerged from the cavernous Vehicle Assembly Building aboard its crawler and begun its stately processional to the launch complex three miles away.